Romano Dal Forno is a local legend. "The rest of us take vacations, occasionally play a round of golf in the afternoons,' said a major Veneto- wine producer, 'But not Dal Forno. He works every day. He not only knows every bunch in his vineyards - he knows every grape!" Romano Dal Forno only established his estate in the 1980s but in Nicolas Belfrage's words "has climbed to the maximum heights which Valpolicella, Classico or otherwise, is capable of attending." 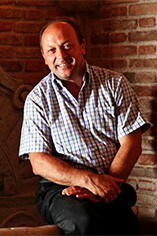 Romano is the undisputed leader of the new wave in Verona's winemaking although his small estate is to be found outside the so-called Zona Classica for Valpolicella, at Illasi. From 8 hectares of vineyard this vigneron-winemaker gets the best out of the Corvina and Rondinella varieties with small yields and rigorous selection during the harvesting. The house speciality is Amarone, but he makes Valpolicella with the same care as well. Fermentation and maceration are designed to extract maximum varietal character from the grapes. Dal Forno has adopted the use of barriques and has been working on ways to ferment the sugars completely out in wood, as if the wine were white. This style of vinification gives the oak a decisive role in the ageing process, without letting it dominate completely. Romano is also experimenting with an ultra-traditional red Recioto and a tiny parcel of fabulous white "passito" wine.